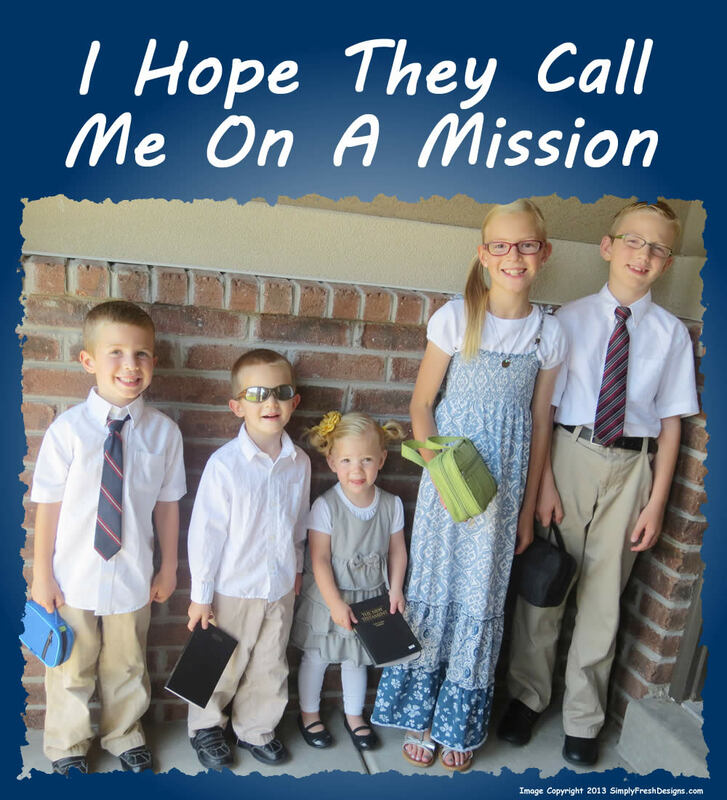 “I Hope They Call Me on a Mission” is a favorite Mormon missionary themed song for LDS children. When I have grown a foot or two. 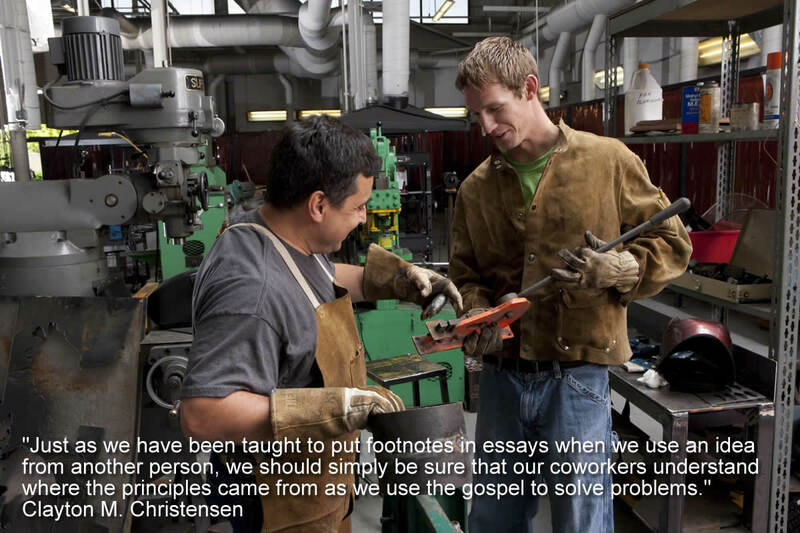 To teach and preach and work as missionaries do. With those who want to know the truth. And serve and help the Lord while I am in my youth. The Power of Everyday Missionaries is an excellent book by Clayton M. Christensen. Brother Christensen has served as a bishop, a counselor in the Massachusetts Boston Mission presidency, and an area seventy. He teaches at Harvard University, is a well-known management consultant, and has researched and written much on business innovation. The Power of Everyday Missionaries teaches the what and how of sharing the gospel. It gives great insight and wonderful examples of how each member of the Church can use the opportunities in everyday life to share the restored gospel of Jesus Christ with our friends and neighbors. I highly recommend the book to all members. 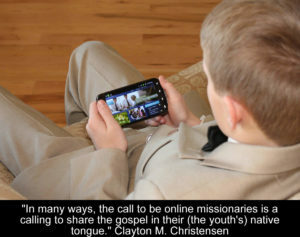 Though it focuses mostly on member-missionary efforts, the knowledge and techniques he discusses will also serve to help young people who are preparing for a full-time mission some day. Your purpose as a missionary is to invite others to come unto Christ by helping them accept the restored gospel through faith in Jesus Christ and His Atonement. 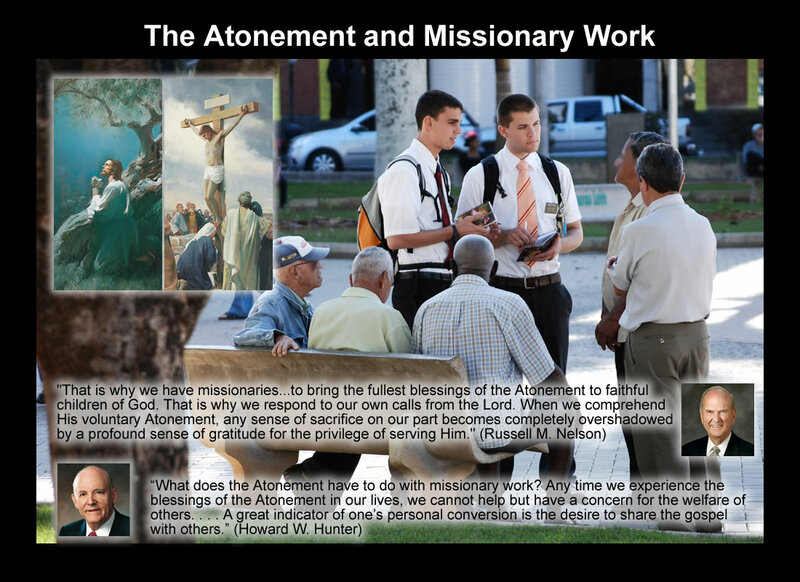 If missionaries are to help other people receive salvation through the Atonement of Christ, then they really should understand it themselves. This article aims to help missionaries and future missionaries understand what the atonement of Jesus Christ is and how it applies to missionary work. That’s it. It’s just that simple, yet that huge. The the Atonement of Jesus Christ is the mission of Jesus Christ. 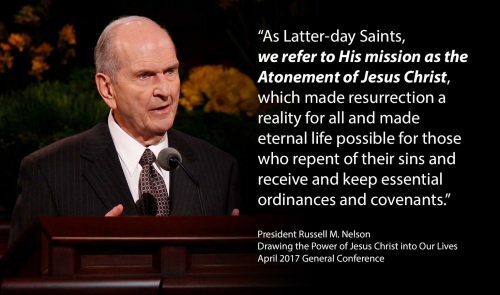 From start to finish, Jesus’ atonement is His mission and his mission was to be the Savior, to create this earth, to come to earth himself, to show us the way, to heal the sick, to teach the doctrine of the Kingdom of God, to offer himself as the great atoning sacrifice, and to be resurrected on the third day. And I would say Jesus’ mission is not over and continues today as He leads His restored Church on the earth and is paving the way for His second coming. Perhaps this is why some authors have called it the continuous atonement. I think it is very important that we not to equate “the atoning sacrifice” of Our Savior with “the atonement” of Jesus Christ. Christ’s atonement includes much more than the suffering in Gethsemane and on the cross and his resurrection from the dead. The atoning sacrifice was certainly part of His atonement or mission, but it was not all of it. I don’t wish to diminish in any way those events and what He did for all humanity by suffering and dying and resurrecting for us. It is just that the the atonement of Jesus Christ includes more than the atoning sacrifice and I think it leads to confusion and limits our ability to draw the power of Jesus Christ into our lives when we misuse the terms. 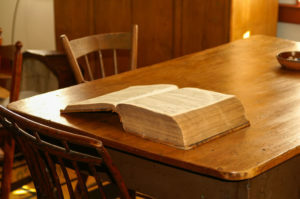 It is doctrinally incomplete to speak of the Lord’s atoning sacrifice by shortcut phrases, such as “the Atonement” or “the enabling power of the Atonement” or “applying the Atonement” or “being strengthened by the Atonement.” These expressions present a real risk of misdirecting faith by treating the event as if it had living existence and capabilities independent of our Heavenly Father and His Son, Jesus Christ….There is no amorphous entity called ‘the Atonement’ upon which we may call for succor, healing, forgiveness, or power. Jesus Christ is the source. 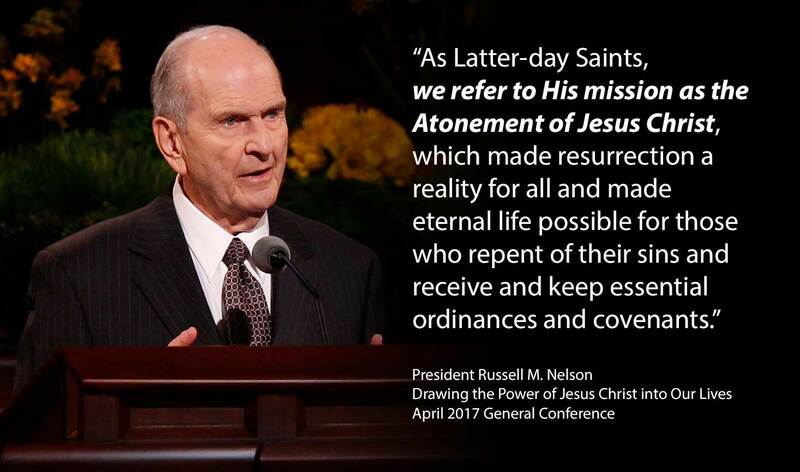 Sacred terms such as Atonement and Resurrection describe what the Savior did, according to the Father’s plan, so that we may live with hope in this life and gain eternal life in the world to come” (Drawing the Power of Jesus Christ into Our Lives by President Russell M. Nelson). To atone, the root word of atonement, means both a state of being “at one” with God and the process by which that is achieved (see The Atonement of Jesus Christ, Part 1 by Hugh W. Nibley). Jesus taught that He and the Father are one and that each of us should be one with them (see John 17: 11, 21). In a miraculous and unfathomable way, Jesus Christ has made atonement for us and has made it possible, through His mission and atoning sacrifice, that we can be one with God some day. Because of Christ’s Atonement, all people will be resurrected and live forever, and those who obey the laws and ordinances of the gospel will receive the greatest of all gifts, eternal life with God (see Article of Faith 3. “The atonement of Christ is the most basic and fundamental doctrine of the gospel, and it is the least understood of all our revealed truths. Many of us have a superficial knowledge and rely upon the Lord and his goodness to see us through the trials and perils of life. But if we are to have faith like Enoch and Elijah we must believe what they believed, know what they knew, and live as they lived. May I invite you to join with me in gaining a sound and sure knowledge of the Atonement” (The Purifying Power of Gethsemane). The good news of the gospel is that Jesus Christ died for us and atoned for our sins and has made it possible that we can repent and return to live with our Father in Heaven. Detailed article on The Meaning of AtonementClick here for an in-depth article I wrote on my personal website about the application of atonement in our lives. As your understanding of the Atonement of Jesus Christ grows, your desire to share the gospel will increase. You will feel, as Lehi did, the “great . . . importance to make these things known unto the inhabitants of the earth” (2 Nephi 2:8). Here are some examples of the natural desire to do missionary work growing as people come to understand the significance and blessings of the Atonement of Jesus Christ. Heavenly Father and Jesus showed their love for all of mankind through the mission and atonement of Jesus Christ. “For God so loved the world, that he gave his only begotten Son, that whosoever believeth in him should not perish, but have everlasting life” (John 3:16). “Greater love hath no man than this, that a man lay down his life for his friends” (John 15:13). Charity is defined in the scriptures as the pure love of Christ. How was that loved manifested? The pure love of Christ is seen through the Savior’s willingness to pay the ultimate price and to make a selfless sacrifice to fulfill the Atonement. I testify that Christ lived on this earth and performed the great atoning sacrifice. I know that through faith in him and by following his ways, we can be cleansed of our sins. This is the greatest miracle of all of God’s miracles. Through faith, repentance, baptism, and the other ordinances and covenants of the restored gospel of Jesus Christ, we can be made whole, worthy, and able to return to our Heavenly father’s presence and partake of the greatest gifts, exaltation and eternal life. I pray that all the young people reading this will study and pray and gain a testimony of the Atonement of Christ, and then show your love and gratitude for the Lord by being a missionary and bringing souls unto Him. Please note: The Church announced on Dec 20, 2018 that sister missionaries in all missions around the world now have the option to wear dress slacks. I will update this article as soon as I can to reflect those changes. 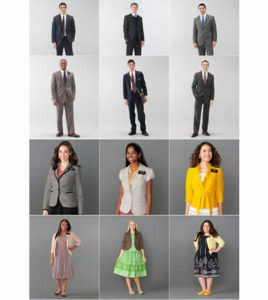 In July 2013, The Church of Jesus Christ of Latter-day Saints published a new, more up-to-date and modern, set of dress and grooming standards for missionaries. Most notable is the lighter colored suits and slacks allowed for the young men: light gray and tan suits, along with khaki dress pants, are now permissible for Elders. Some major changes also took place with the Sister missionary wardrobe with the last couple of years, with nylons becoming optional and the minimum dress length going from mid-calf to the knee. For both men and women, lighter, brighter colors are now allowed. 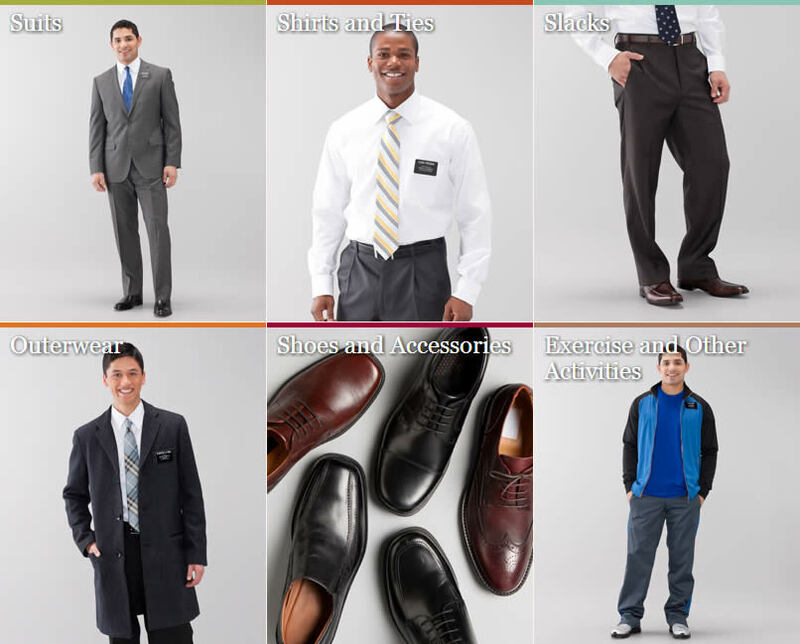 The official missionary dress and grooming standards are found on the Dress and Grooming section of the LDS.org page for missionaries. This Church website has volumes of very detailed information, including hundreds of pictures, describing appropriate dress and grooming of missionaries. When you are ready to buy clothes for you mission, review the Church site on missionary dress and grooming, following the missionary clothing list you’ll get in your call packet, also be aware of the area specific information you will get from your mission president. 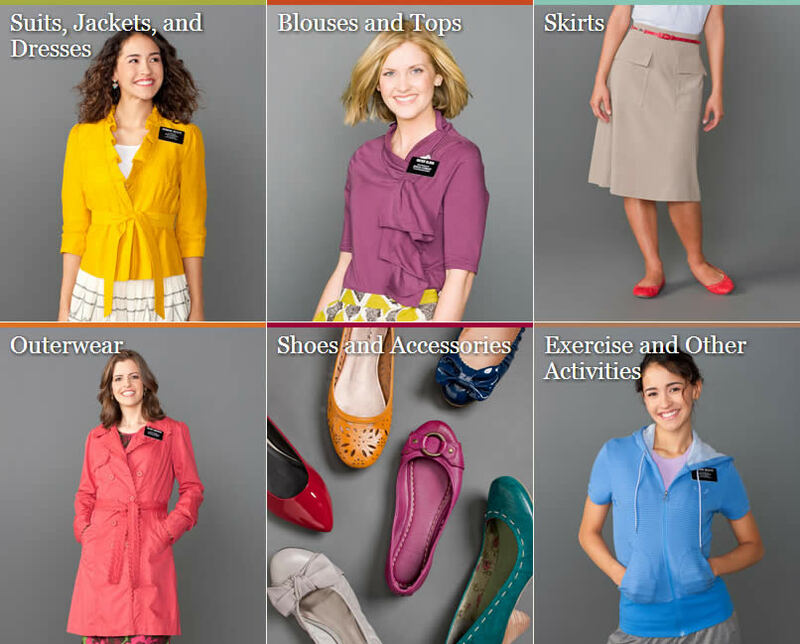 See Female Missionary Dress and Grooming Guidelines for more details. See the Male Missionary Dress and Grooming General Guidelines for more details. Standards for dress and groom of older missionaries are relatively the same as those for younger missionaries. For specific senior missionary dress and grooming guidelines, visit the Provo MTC website. As a missionary, you are an ambassador, or representative of the Lord Jesus Christ. The dress and grooming guidelines websites reminds future missionaries that “as an ambassador of the Lord you are to wear professional, conservative clothing that is consistent with your sacred calling and that will clearly identify you as a missionary for The Church of Jesus Christ of Latter-day Saints.” To sister missionaries, Thomas S. Monson once said, “You can dress attractively without being immodest. Within the Lord’s guidelines, there is room for you to be lively, vibrant, and beautiful both in your dress and in your actions.” Elder Jeffrey R. Holland reminds us, “we have always been invited to present our best selves. … We should be recognizable in appearance as well as in behavior that we truly are disciples of Christ.” I pray that all LDS missionaries will do this, and that through their appearance, example, and teachings, more of God’s children will desire to follow Jesus Christ and come unto Him. 6:30 a.m. Wake up, pray, exercise, and do other preparation for the day. 8:00 a.m. Personal study: the Book of Mormon, other scriptures, chapters from Preach My Gospel, etc. with an emphasis on the doctrines of the missionary lessons. 9:00 a.m. Companion study: share what you have learned during personal study, prepare to teach, and confirm plans for the day. 10:00 a.m. Language study for 30 to 60 minutes, if necessary and approved by your mission president. 10:00 a.m. Begin proselyting: teaching appointments, finding people to teach, open your mouth, etc. Lunch and Dinner: You may take an hour for lunch and an hour for dinner at times that fit best with proselyting. Normally, dinner should be finished no later than 6:00 p.m.
9:00 – 9:30 p.m. Return to the apartment and plan the next day’s activities. Write in journal, prepare for bed, pray. This schedule may vary a little in some countries and missions. For example, in the Rosario Argentina mission, where I served from 1995 to 1997, we were expected to be out proselytizing by 9am and we had our companionship study after lunch when the rest of the country was taking a siesta (nap). 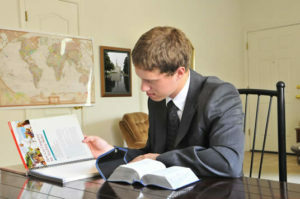 Missionaries are expected to follow this schedule every day, except on preparation day (P-Day). On p-day, missionaries get up at the usual time, get ready, and do their personal and companionship study, but then, rather than going out to teach and proselytize, they use the day to do laundry, go shopping, write letters to family and friends, and perhaps have some recreational activities. P-day ends around dinner time (6:00 P.M.), after which missionaries are expected to carry out their normal proselytizing schedule. 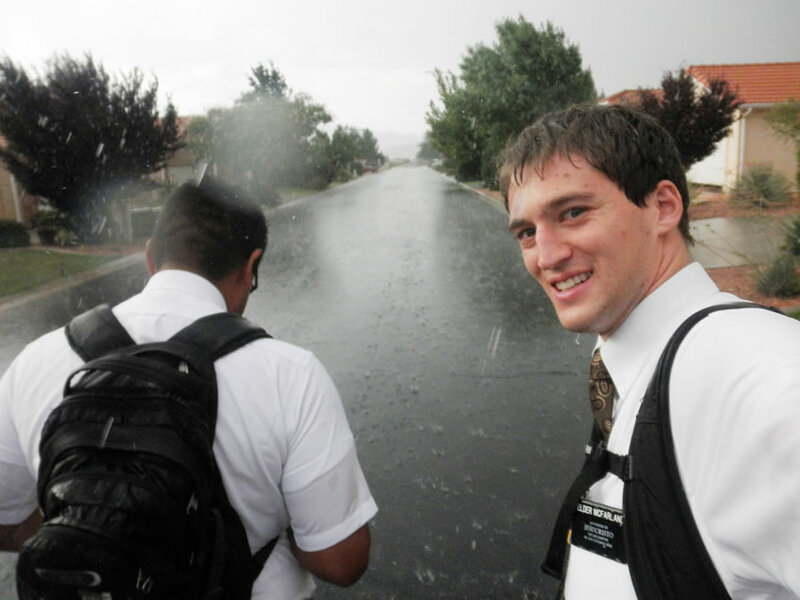 Even when it is hot, or snowy, or rainy, or cold, it is important for missionaries to keep this schedule. As missionaries do so, the Lord will bless them, for God “doth require that ye should do as he hath commanded you; for which if ye do, he doth immediately bless you” (Mosiah 2:24). It is important for missionaries to be out of their apartment, meeting people, and sharing their testimony at the most opportune times. If it is mid-morning, 10:30-ish, and missionaries are still in their apartment, then they are not where you are supposed to be. But if, at that time, they are knocking doors, meeting people, and sharing their testimony, then the Lord will bless their efforts and help them find people he has chosen to hear the message of the restored gospel of Jesus Christ. If missionaries linger at a member’s home after a dinner appointment and have been there for long past the prescribed hour, then they are not keeping the missionary schedule. If, rather, missionaries keep their dinner appointments brief, thank the members for their hospitality, and get on their way to your next teaching appointment, then they are working hard and being obedient and the Lord will bless them to be a better instrument in His hands. Had I not been obedient to the missionary daily schedule, I would have missed out on many opportunities to meet families and eventually see them join the true Church of Jesus Christ. Once, when I had just been transferred, I arrived in my new area around 8:30 in the morning. It would have been easy to justify lingering longer in the apartment to unpack my suitcases, but by 9am we knew we were supposed to be out working, so we hit the pavement. It just so happened that within minutes of leaving the apartment, my companion and I first met Juan Carlos Lopez, who eventually got baptized. Had we chosen to disobey the rules and not keep the missionary schedule, then we may never had met Juan Carlos. As missionaries are obedient to the mission rules, including the daily schedule, they will have the Spirit in greater measure. They will be guided by God and be more successful in their important labors. Summary: When missionaries are in the right place at the right time, they will have the Spirit of the Lord with them which will bear testimony that what they are teaching is true, a crucial element of the conversion process. The principle of being in the right place at the right time applies to all of us. It means to do what the Lord expects you to do at the time the Lord expects you to do it. It applies to missions, temple marriage, and everyday opportunities to serve our fellow beings. For today, I’d like to focus on what it means for young men and all missionaries to be in the right place at the right time. It was in that same talk that President Monson announced the reduced age for missionary service for young men to be 18 years old. Said Pres. Monson, “I am not suggesting that all young men will—or should—serve at this earlier age. Rather, based on individual circumstances as well as upon a determination by priesthood leaders, this option is now available.” The prophet has never said that young men need to leave on their mission right at age 18. He gives young men the flexibility to find a good time to go, to wrap up school or work or athletics, and then go on a mission. But certainly by the time that young men reach their early twenties, if they are going to school or working or involved in athletics instead of being out in the mission field, they are not in the right place at that time in their life. The age limit for men to serve a mission is 25, so for young men in their early 20s, the right place to be at that time of life is on a full-time mission. 6:30 a.m. Wake up, pray, exercise, eat breakfast, and do other preparation for the day. 8:00 a.m. Personal study: the Book of Mormon, other scriptures, chapters from Preach My Gospel, etc. 9:00 a.m. Companion study: share what you have learned during personal study and prepare to teach. 10:00 a.m. Begin proselyting: teaching appointments, finding people to teach, etc. Lunch and Dinner: You may take an hour for lunch and an hour for dinner at times that fit best with proselyting. This schedule may vary a little in some countries and missions. For example, in the Rosario Argentina mission, where I served from 1995 to 1997, we were expected to be out proselytizing by 9am and we had our companionship study after lunch. Even when it is hot, or snowy, or rainy, or cold, it is important for missionaries to keep this schedule. The schedule helps you as a missionary be in the right place at the right time, and as you do so, the Lord will bless you. It is important to be out of your apartment, meeting people, and sharing your testimony at the most opportune times. If it is mid-morning, 10:30-ish, and you are still in your apartment, then you are not in the right place at the time time. If it is mid-morning and you are knocking doors, meeting people, and sharing your testimony, then you are in the right place at the right time. If you have been lingering at a member’s home after a dinner appointment and you have been there for over an hour, then you are not in the right place at the right time. If you keep your dinner appointment to under an hour, thank the members for their hospitality, and then you get on your way to your next teaching appointment, then you are in the right place at the right time. You get the point. Keeping this schedule is an important component of being obedient to the mission rules. And as you are obedient to the rules you are asked to live by, you will have the Spirit in greater measure. You will be guided by God and be more successful in your missionary labors. Finding Juan Carlos Lopez. I had just been transferred to the area and it would have been easy to justify lingering longer in the apartment to unpack my suitcases. But it was 9am, and we knew we were supposed to be out working. And it was that morning that my companion and I ran into Juan Carlos Lopez, who eventually got baptized. Reconnecting with a Family in Rosario. We had taught a family in the city of Rosario and they had been progressing well, when all of a sudden they lost interest in meeting with us. We didn’t see them for a few weeks, but one day when we were out working, we happen to run into them on the sidewalk and we resumed the discussions. They got baptized soon thereafter, and this wouldn’t have happened if we hadn’t been out working at the appropriate time. Finding teaching and baptizing the Lescano Family wouldn’t have happened if we hadn’t been in the right place at the right time. Also, meeting and getting an appointment with the Godoy family is another example to led to a family being baptized. The examples could go on and on. Future missionaries, you will be called by God as a missionary and sent to the place where the Lord would have you serve. There are people in that area that need the gospel and need you to bring it to them. Please be in the right place at the right time in order to do the work and bring the blessings of the gospel to the people of the world according to your call from God. Be where you are supposed to be. Do what you are supposed to do. Open your mouth, preach the gospel, bear testimony of the Savior, and teach by the Holy Ghost. The Spirit will testify to the hearts of the people that what you are teaching is true and you will have more power to convert. I know that as you do this you will be blessed and you will be an instrument in the hands of the Lord in bringing to pass much righteousness. I was in a recent stake conference priesthood leadership meeting where Elder Russell M. Nelson of the Quorum of the Twelve presided and spoke. He opened up the meeting to questions, and one brother asked for his advice in preparing young people for a mission. Elder Nelson gave two pieces of advice: one, study the word of the Lord in the scriptures, and two, gain a testimony of the prophet Joseph Smith. I’d like to focus on the latter today, particularly on Joseph Smith’s First Vision. 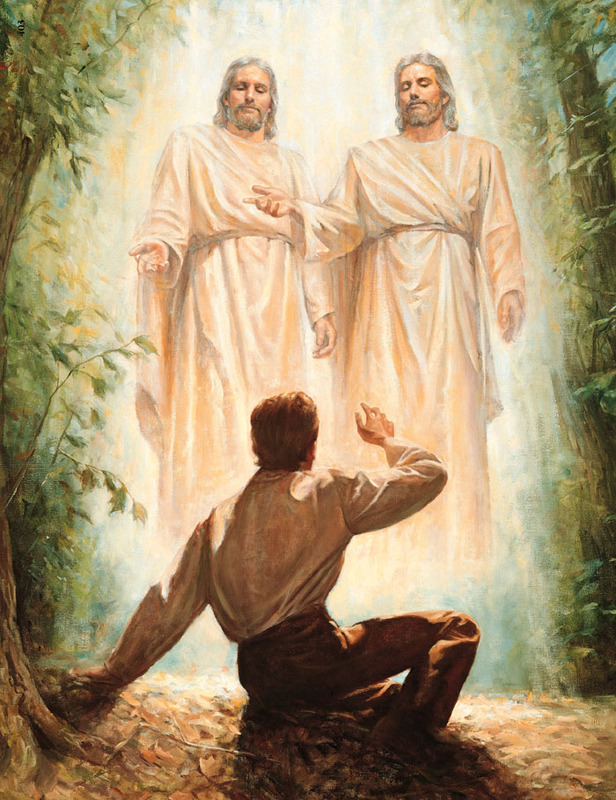 Many of the important gospel truths that LDS missionaries teach were restored through Joseph Smith–that we lived with God before our birth, the importance of gospel ordinances, the necessity of priesthood authority, that families can be together forever, and much added depth of understanding of the Atonement of Jesus Christ. One of the most profound truths restored through Joseph the Prophet was about the nature of God and Jesus, and much of that was learned in the First Vision. In the spring of 1820, after much meditation and studying of the bible, 14-year-old Joseph Smith followed the counsel in James 1:5 that “if any of you lack wisdom, let him ask of God.” Joseph desired guidance in his life, he wanted to know which church was correct, and he desired to be cleansed from his sins. He left his home one morning and found seclusion in a grove of trees and prayed. In response to this prayer, God the Father and His Son, Jesus Christ, appeared to Joseph Smith. This sacred experience was the beginning of the Restoration of the gospel of Jesus Christ. It led to other visitations by angelic messengers, to the coming forth of new scriptures such as the Book of Mormon, and to the establishment of The Church of Jesus Christ of Latter-day Saints with priesthood authority from God. Some young people are surprised to learn that Joseph Smith wrote, or dictated, his First Vision experience four times. Each account of the First Vision was written in response to different needs and addressed different audiences. The four accounts were written in 1832, 1835, 1838, and 1842 respectively. Critics of the Church like to focus on the differences in these tellings of the First Vision and use such differences as they can find to attack Joseph Smith. But I have found that the four accounts of the First Vision are rather complementary of each other, and come together in beautiful harmony. Each emphasizes different aspects of his experience, and gives different insights about Joseph and his interaction with Diety. 1832 Account: Though it was written twelve years after the experience, this is the first written account we have. It was part of Joseph’s autobiography and emphasized his search for religious truth and his desire to be forgiven of his sins. 1835 Account: This one comes from a conversation Joseph Smith had with a visitor to Kirtland, Ohio and was recorded in his diary by one of his scribes. One detail unique to the 1835 account is Joseph’s statement that in addition to two personages, he saw many angels. 1838 Account: This is the version found in LDS scriptures, in the Pearl of Great Price. It is clear that the Prophet Joseph more carefully prepared this account and intended it to be the primary one used in the telling of the history of the Church. The emphasis of this description of the First Vision is Joseph’s initial confusion regarding the various religions and God’s declaration regarding the true Church. For more information, please refer to the gospel topic article called Accounts of the First Vision on LDS.org or the article appearing in the Ensign magazine in January 1985 called Joseph Smith’s Recitals of the First Vision. I was in a meeting once where Elder David A. Bednar spoke. He mentioned the scripture above and pointed out that a key doctrine in that verse is that Joseph Smith learned the truth for himself. Learning the truth for ourselves is something we all must do. Missionaries especially must gain their own testimony that Joseph Smith was the prophet of the Restoration, that the Book of Mormon is true, and that Jesus Christ is our Savior and Redeemer. I knew it then and my testimony is even stronger now. I know that this event really happened. Joseph was personally visited and called by God to be a prophet and to be the instrument in the Lord’s hand in restoring the full gospel of Jesus Christ to the earth. I highly recommend that all future missionaries memorize this verse now. As you do so, your testimony will grow. Your purpose as a missionary is to preach the gospel of Jesus Christ as restored through the Prophet Joseph Smith. The Book of Mormon is powerful convincing evidence that Jesus Christ lives and loves us, that Joseph Smith is a true prophet, and that The Church of Jesus Christ of Latter-day Saints is God’s true church. I pray that you can develop your own testimony of these things and “learn for yourself.” The gospel will bless individuals and families, it will help meet their spiritual needs, and it will help them gain their deepest, truest desires in this life and in the eternities. 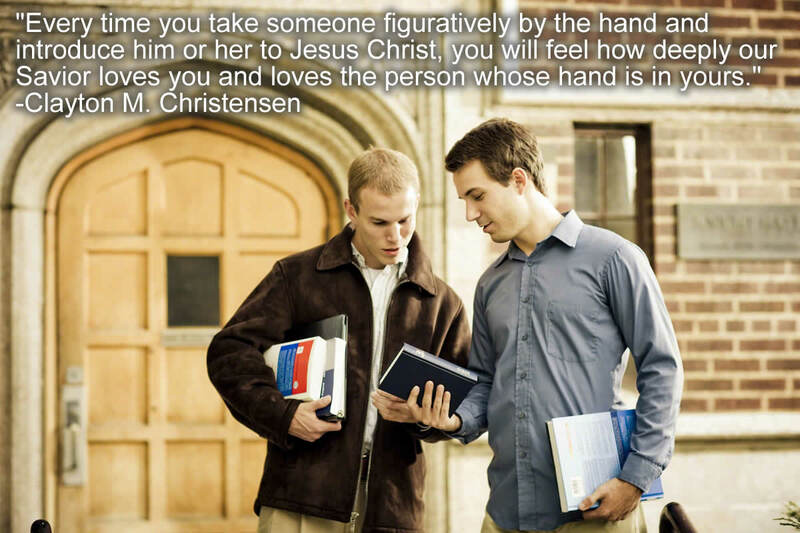 And as a missionary you will have the pleasure of being an instrument in the Lord’s hands to deliver those blessings. Summary: Understanding why keeping the law of chastity is important will help young people see the divine purpose behind this commandment and inspire them to live it. Why is the law of chastity so important? Physical limitations prepare us for eternity. “Our relationships with other people, our capacity to recognize and act in accordance with truth, and our ability to obey the principles and ordinances of the gospel of Jesus Christ are amplified through our physical bodies…Simply stated, there are lessons we must learn and experiences we must have, as the scriptures describe, “according to the flesh” (1 Nephi 19:6; Alma 7:12–13). Being chaste brings blessings. “Alma counseled his son Shiblon to “bridle all [of his] passions, that [he] may be filled with love” (Alma 38:12). Significantly, disciplining the natural man in each of us makes possible a richer, a deeper, and a more enduring love of God and of His children. 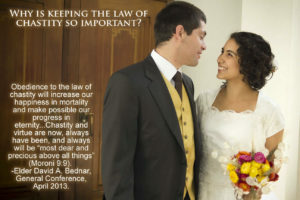 Love increases through righteous restraint and decreases through impulsive indulgence…Obedience to the law of chastity will increase our happiness in mortality and make possible our progress in eternity…Chastity and virtue are now, always have been, and always will be “most dear and precious above all things” (Moroni 9:9). Discussing “the why” of keeping the law of chastity is a topic Elder Bednar has also spoke about in years past. In his June 1998 Education Week talk titled Teach Them to Understand, Elder Bednar spoke about the importance of understanding “the why” of gospel commandments. I pray that all future missionaries will study, ponder, and prayer about why this commandment is so important and the ways in which keeping the law of chastity will bless their lives. Understanding these things will give them added strength in fighting the many temptations that bombard our youth today. Parley P. Pratt was a great missionary for the LDS Church in it’s early days. He was one of the original members of the Quorum of the Twelve Apostles in these later days. 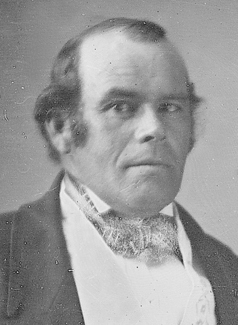 Due to his extensive missionary travels and voluminous writings in the early days of the restoration of the gospel of Jesus Christ, Parley P. Pratt has often been called “the Apostle Paul of Mormonism.” His conversion story is an inspiring tale one of diligently seeking for the truth and embracing the gospel once found. Parley and Thankful were married a short time later. Parley and Thankful returned to where Parley had spent the previous winter and made a home for themselves there. The cabin was replaced with a frame house. They planted a garden, an orchard of apple and peach trees, and vast fields of grain. About this time, reports Parley, “one Mr. Sidney Rigdon came into the neighborhood as a preacher, and it was rumored that he was a kind of Reformed Baptist… At length I went to hear him, and what was my astonishment when I found he preached faith in Jesus Christ, repentance towards God, and baptism for remission of sins, with the promise of the gift of the Holy Ghost to all who would come forward.” Though Sidney Rigdon had yet to learn about the restored gospel of Jesus Christ, like Parley, he was searching. When Parley and Thankful arrived in Rochester, New York, Parley felt inspired to linger longer. He sent his wife ahead and said to her, “I will come soon, but how soon I know not; for I have a work to do in this region of country, and what it is, or how long it will take to perform it, I know not; but I will come when it is performed.” Parley didn’t know it at the time, but he was about to encounter a life changing book, The Book of Mormon. A man named Hamlin “began to tell of a book, a STRANGE BOOK, a VERY STRANGE BOOK! in his possession, which had been just published. This book, he said, purported to have been originally written on plates either of gold or brass, by a branch of the tribes of Israel; and to have been discovered and translated by a young man near Palmyra, in the State of New York, by the aid of visions, or the ministry of angels. I inquired of him how or where the book was to be obtained. He promised me the perusal of it, at his house the next day, if I would call. I felt a strange interest in the book. …Next morning I called at his house, where, for the first time, my eyes beheld the “BOOK OF MORMON” that book of books-that record which reveals the antiquities of the “New World” back to the remotest ages, and which unfolds the destiny of its people and the world for all time to come; that Book which contains the fulness of the gospel of a crucified and risen Redeemer; that Book which reveals a lost remnant of Joseph, and which was the principal means, in the hands of God, of directing the entire course of my future life. “I opened it with eagerness, and read its title page. I then read the testimony of several witnesses in relation to the manner of its being found and translated. After this I commenced its contents by course. I read all day; eating was a burden, I had no desire for food; sleep was a burden when the night came, for I preferred reading to sleep. Parley went immediately to Palmyra, New York to find Joseph Smith. When he arrived he spoke with Hyrum Smith, who informed him that Joseph was away in Pennsylvania. Of the Book of Mormon, Parley P. Pratt said, “This discovery greatly enlarged my heart, and filled my soul with joy and gladness. I esteemed the Book, or the information contained in it, more than all the riches of the world. Yes; I verily believe that I would not at that time have exchanged the knowledge I then possessed, for a legal title to all the beautiful farms, houses, villages and property” in the whole state of New York. Parley demanded that Hyrum Smith baptism him, so the next day they walked 25 miles to the Whitmer residence where they received “a most welcome reception.” The Whitmer family had been instrumental in supporting Joseph Smith in the translation and publishing of the Book of Mormon. “We rested that night, and on the next day, being about the 1st of September, 1830, I was baptized by the hand of an Apostle of the Church of Jesus Christ, by the name of Oliver Cowdery. This took place in Seneca Lake, a beautiful and transparent sheet of water in Western New York. “A meeting was held the same evening, and after singing a hymn and prayer, Elder Cowdery and others proceeded to lay their hands upon my head in the name of Jesus, for the gift of the Holy Ghost. After which I was ordained to the office of an Elder in the Church, which included authority to preach, baptize, and minister the sacrament, administer the Holy Spirit, by the laying on of hands in the name of Jesus Christ and to take the lead of meetings of worship. May each of us be as diligent as Parley P. Pratt in seeking out the truths of the gospel of Jesus Christ. And my we all catch the vision of the purpose of missionary work as he did, and do our best to share the light of the gospel with others.